This project owes its existence to a remark Harv made about three years ago: "I'd like to get my hands on an old VRA (volts, resistance, amps) meter, similar to the one shown in the early workshop manuals." 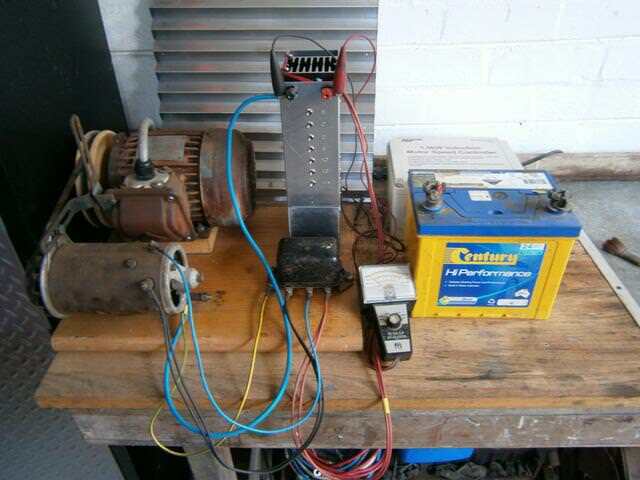 I'd had an idea to build a bench-testing setup for generators for a while (since childhood, actually - my grandfather had made a demo unit out of an electric motor, an Austin 7 generator, an ammeter and a lamp). Harv's request made it happen. There was a three-phase motor sitting in the e-waste bin at work. It spun freely, and all three windings had the same DC resistance, so electrically and mechanically it was OK. One of the electricians at work kindly wired a "Jesus cord" to it, plugged it in and flicked the switch. It went, and made me wonder why it was in the bin. There's the source of motive power. But (1) - it's a three-phase motor. I only have single-phase power at home. But (2) - it's an induction motor. It's not variable-speed. But (3) - it's a four-pole machine: 1500 rpm at no load. Fortunately, Altronics sells a variable-speed controller kit for induction motors. Single-phase mains goes in, variable-frequency three-phase power comes out. That's the first two problems dealt with. 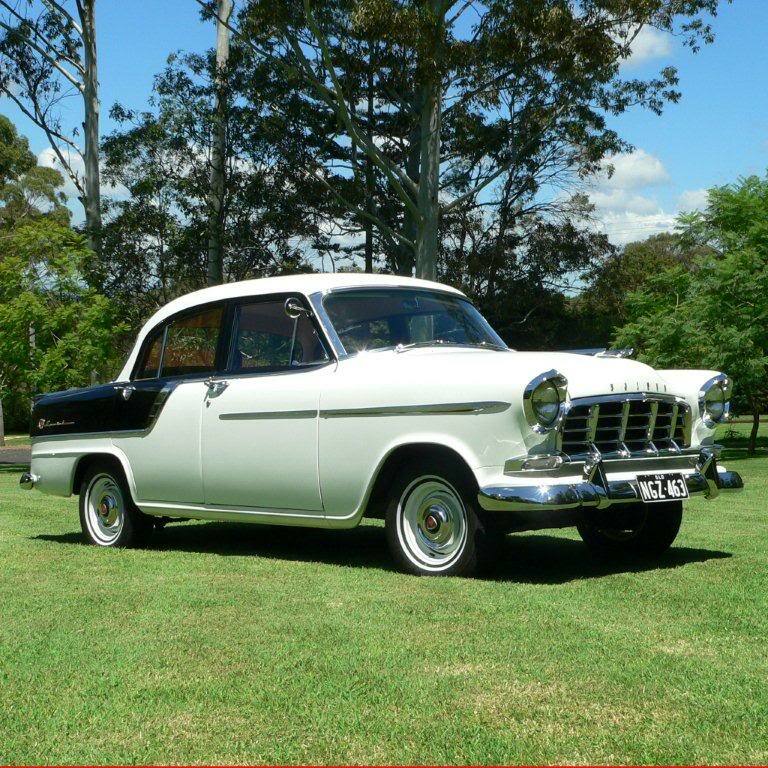 (3) can be overcome by making the drive pulley about twice the size of the Holden crankshaft pulley, so that I can run the generators at a speed equivalent to about 60 mph, which will be more than enough to get maximum output, should it be required. I built the kit, and delta-connected the three-phase motor's windings as suggested. I needed a pulley with a groove deep enough to take both A and B section belts, because I'd be mucking around with both 6V and 12V generators. I discovered a piece of wooden kitchen benchtop, drilled a 3/4" hole in it, filed the keyway by hand, and drove it onto the motor's shaft. Now - how to true it up and cut the groove? I figured I would G-clamp the motor onto the bed of my father's wood lathe and turn the groove into the pulley. Much sawdust later, job done. I mounted the motor onto another piece of benchtop, which I drilled to take voltage regulators. A couple of generator mounting brackets and some 8 mm dia rod, cut to length and tapped 5/16" UNF, with 8 mm ID aluminium tube cut to size, allowed me to mount the generators. I attached the top generator bracket to the motor via some angle. With this setup I was able to test generators and adjust regulators; but providing a suitable load was difficult - a hand-held 12V 50W halogen lamp was about the best I could do easily; and for 6V systems it didn't draw anywhere near enough current. Something better is needed. So what I want is a constant-current, switchable load. Constant current? That's so that it'll pull the same current with a 6V generator as with a 12V one. With loads of 1, 2, 2, 5, 10 and 20 amps I can set any current from zero to 40 A in 1 A steps, and I don't need an ammeter. Whereas in your old-school lamp bank or resistive load, the current isn't in nice multiples of amps, so an ammeter is required. And the poor switches have to handle the full load current. There are better ways of doing things . . . Warning - electronics tutorial follows. A voltage regulator IC takes an input voltage and "cuts it down" to make a precise output voltage. If you connect a resistor to the output, the resistor draws a constant current, because the output voltage is constant. Now for the subtle bit: "seen" from the input, the regulator and resistor draw the same current, regardless of the input voltage. 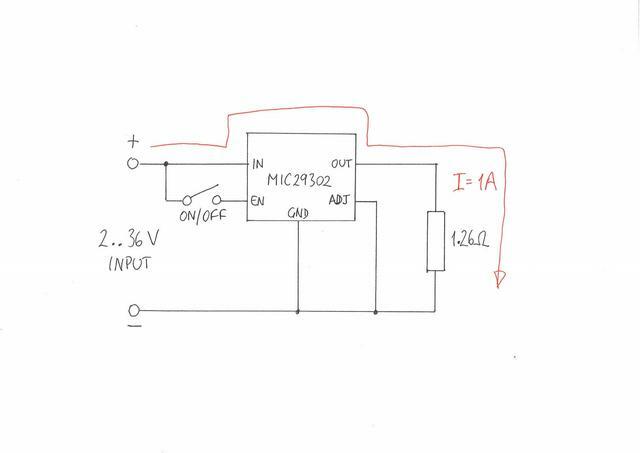 Constant current draw independent of supply voltage is exactly the property I want. And these days, voltage regulators come with a whole lot of "smarts" built-in: high output current, overload protection, and external control. Micrel makes a family of regulators with 1.26 V output, high output current, and external enable. To make a 1 A load, connect 1.26 ohms between the output and ground. For 2 A, the resistor is 0.63 ohms, and for 5 A, 0.252 ohms. The main problem is not in coping with the current, but getting the heat out of components. For the higher current loads, the resistor dissipates a lot of heat, and so does the regulator. A big heatsink becomes mandatory. And I need a way of boosting the current without letting the smoke out. You can "keep the smoke in" with a big power transistor and a low-value resistor. Put the resistor in series with the regulator's output, and connect the transistor across the regulator. The resistor senses the current drawn by the regulator. When the current rises to a certain value, the transistor turns "on" and bypasses the regulator. 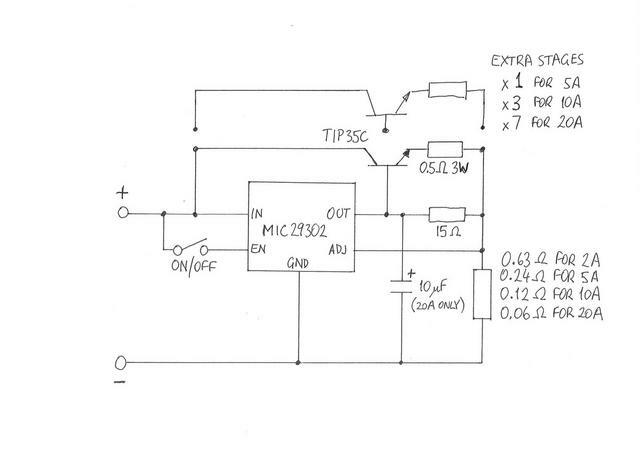 The regulator is still in control of the situation and holds the voltage across the load constant, it's just that most of the load current now flows through the transistor. In mucking around with this arrangement, I found I needed one booster transistor for every 2 A of load current, thus two for the 5 A load, four for the 10 A load, and eight for the 20 A load. When connecting the transistors in parallel, I needed a half-ohm resistor, one per transistor, to make them share the load equally. Now came the time to raid the parts bin at work. I had stacks of Jaycar heatsinks left over from a previous project. They come in two halves, and assemble onto an 80 mm fan. At 40 A and 14 V, the load will be dissipating 560 W. This'll place serious demands on the cooling fan. I laboriously mounted the components onto the heatsinks and point-to-point wired the electronics, just like in a valve guitar amp. And then a colleague took a glance at my work and said, "nice job, but it'll work for about half an hour until the PVC insulation goes soft and you get short-circuits." And so I completely rewired it with Teflon-insulated wire. The 1,2,5 and 10-amp loads worked perfectly. The 20 A load was a bit flaky and would only pull 20 A at some voltages and not at others. And then I could change its behaviour by waving my hands over the circuit. That's the classic symptom of radio-frequency oscillations. In situations like this, the data sheet recommends a bypass capacitor on the voltage regulator's output pin. The final touch was to make covers for the unit, which double as cooling ducts. It was not much trouble to bend them up out of sheet metal. And the sheet-metal worker at work is a genius at TIG-welding thin aluminium. After having done the design and assembly work on the sly as a "foreign order", a colleague needed an electronic load for testing power supplies. Commercial electronic loads all have microprocessors in them and generate radio interference. Mine is purely analog, and doesn't produce interference. So I am now in the curious situation of having a foreign order elevated to "official" status. Once we had measured the output noise of the power supplies for the new ultra-wideband Parkes receiver, I gave the electronic load a test run with my FX's Delco generator, which I thought was misbehaving. At 20 A load, the generator worked fine. But when I switched the 20 A load off, there was a "cough", and a puff of smoke came out of the heatsinks. The cooling fan didn't appreciate the voltage spike, and promptly blew up. Some more work is needed . . . I am pleased to offer a generator testing and rebuild service, and I can set up voltage regulators too. One thing I can't do, though, is armature rewinds. Sounds like you need to put a reversed polarity diode across the fan if it was the fan that it was a Lucas and let the smoke out. You went the hard way to get a variable speed for the 3 phase motor. I looked at that when I wanted to make my wood lathe variable speed rather than changing the belt positions all the time. I ended up buying a Huanyang Inverter from eBay for under $200. A genuine one not the cheaper look alike they advertise as a Haunyang style. After tweaking the parameters it works a treat. It is a 1.5 KW unit. You're right - it was a lot of work assembling the motor drive kit, but I didn't know that alternatives were available. And I wonder whether it was over- or reverse voltage that killed the fan. I might have to protect the fan with something like a few big Zeners or a low-dropout regulator of its own. Nonetheless, I have some regulators to adjust. Must attend to that. Definitely need some form of overvoltage protection. Adjusting the current limit on a regulator, I made the fatal error of switching off the 20-A load with the generator charging, and popped the 1-A load. Didn't know ceramic wirewound resistors could glow red, but they do. So I went back to the old-school method of car battery, ammeter, and holding the voltage regulator contacts closed to adjust the current limit. Sounds like your having a lot of fun? and still have a few teething problems to sort out still. Yes I have only seen once those ceramic resistors get red hot and this was on a fiberglass PCB. Did wonders to the boars and the copper strips nearby. Yep. I've seen what an overheated wirewound resistor can do to a PCB. Point-to-point wiring is a pain, but is more tolerant of cooked components.